Throughout the ages, the ancient arts of Zen and meditation have helped warriors prepare for battle, brought philosophers to enlightenment, and opened the path to inner peace for countless practitioners. Perhaps most importantly, however, these practices have allowed golfers to transcend their game and shave precious strokes off their handicaps. 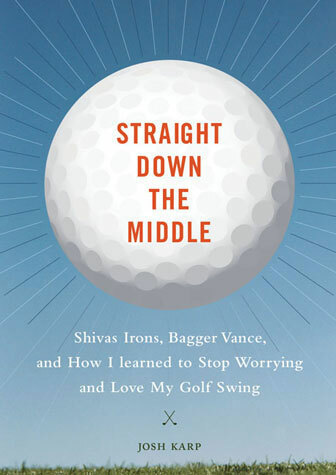 In this hilarious memoir, journalist and former-18-handicap Josh Karp tries it all—from quantum physics to Feldenkrais— in an attempt to transform his mindset, lower his score, and tap into the mystical connection between golf and spirituality. Assisted by a quirky roster of Zen-influenced golf masters, Karp’s unique experiences across the fairways of North America (and Scotland, of course!) are as funny as they are enlightening. Straight Down the Middle chronicles the lessons learned during the inspired, at times frustrating, but always entertaining, journey of a common man in search of an uncommon kingdom.